From the genuinevintage collection of period packaging. 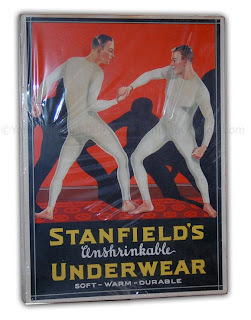 Stanfield's became famous for supplying warm and comfortable longjohns to the gold miners during the Yukon gold rush of 1898. This box dates from about 1939 and show strong manly graphics. Two handsome lads, wrestling in their underwear in a manly way. Love the shadows.